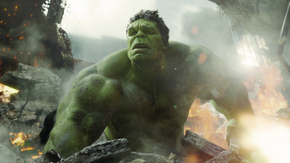 Mark Ruffalo has been winning plaudits for his portrayl as both Bruce Banner and The Hulk in this year's superhero blockbuster, Avengers Assemble. And Marvel Entertainment have taken note and signed the Shutter Island star to a massive six-film deal. This is likely to include at least two more Avengers flicks and his own solo run. Ruffalo has been full of praise about the all-star ensemble film. "The experience was great. I really had a good time. It was fun, and I love that group of people." There have been two relatively poor recent Hulk films. Eric Bana took on the green giant in 2003 and then Ed Norton in 2008, but both failed to really capture one of Marvel's most intriguing characters. But there is renewed optimism after Rufallo breathed new life into the gamma-fueled monster. The Kids are All Right actor is the first person to play both Banner and The Hulk on film. In both previous films the doctor's angry alter-ego was brought to life using CGI, but in the Avengers Ruffalo donned a motion capture suit. Marvel studios supremo Kevin Feige said last month that a new solo Hulk film was being considered. "When it'll be, who knows, but the conversation's definitely started."